Located in the 8th arrondissement, the Champs-Elysees is considered by many to be the most impressive avenue in all of Paris. The avenue connects the Place de la Concorde and the Place Charles-de-Gaulle, two very large and heavily trafficked squares in the capital of France. Measuring roughly 1,910 meters long and 70 meters wide, the sheer size of the Champs-Élysées is enough to impress the most jaded visitor. Designed by André Le Nôtre under the orders of Louis XIV, the avenue did not gain its famous reputation until the 19th century when it became the spot for bourgeois residences that created an atmosphere of elegance. In the 20th century, the Champs-Élysées became a much more commercial avenue and is currently dominated by major brands. Louis Vuitton, Cartier, Sephora, Zara and Nike are just a few of the brands that have a major presence on this famous avenue. In many cases, these locations serve as flagship stores. For visitors who want to do some sightseeing in addition to shopping, the magnificent Arc de Triomphe sits right on the western end of the Champs-Élysées. 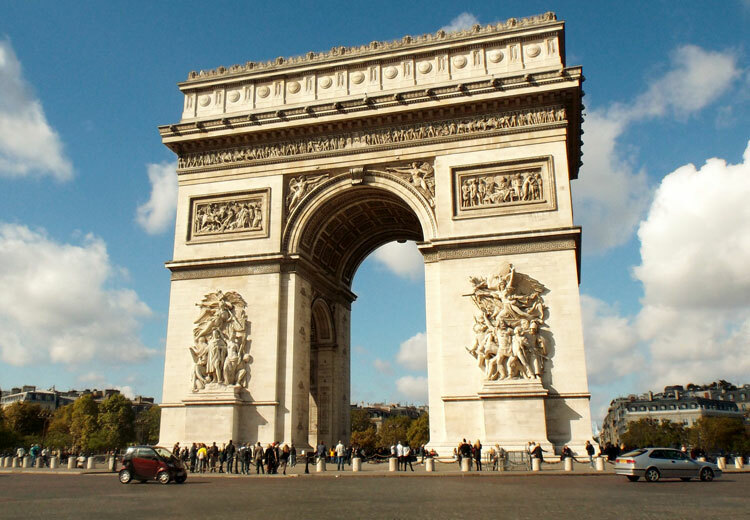 The Arc de Triomphe was built between 1806 and 1836 — commissioned by Napoleon, who wanted to honor the victories of the French troops after the Battle of Austerlitz. Reaching almost 30 meters in height, the Arc de Triomphe is encircled by a busy, car-filled roundabout. Visitors can access the monument through an underground tunnel. It is possible to make the long climb to the top from inside the Arc de Triomphe, and those who do will be rewarded with great views.